Description: This collection of essays continues the investigation of religious experience in early Judaism and early Christianity begun in Experientia, Volume 1, by addressing one of the traditional objections to the study of experience in antiquity. The authors address the relationship between the surviving evidence, which is textual, and the religious experiences that precede or ensue from those texts. Drawing on insights from anthropology, sociology, social memory theory, neuroscience, and cognitive science, they explore a range of religious phenomena including worship, the act of public reading, ritual, ecstasy, mystical ascent, and the transformation of gender and of emotions. Through careful and theoretically informed work, the authors demonstrate the possibility of moving from written documents to assess the lived experiences that are linked to them. The contributors are Istv�n Czachesz, Frances Flannery, Robin Griffith-Jones, Angela Kim Harkins, Bert Jan Lietaert Peerbolte, John R. Levison, Carol A. Newsom, Rollin A. Ramsaran, Colleen Shantz, Leif E. Vaage, and Rodney A. Werline. 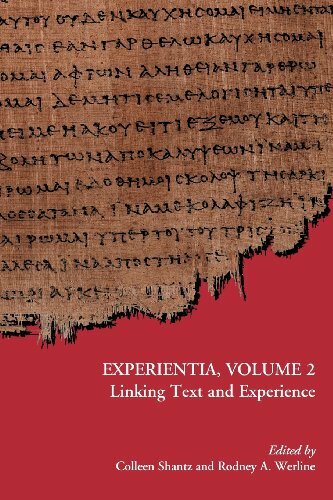 Citation: Scott D. Mackie, review of Colleen Shantz and Rodney A. Werline, eds., Experientia, Volume 2: Linking Text and Experience, Review of Biblical Literature [http://www.bookreviews.org] (2013). Citation: Andrew R. Guffey, review of Colleen Shantz and Rodney A. Werline, eds., Experientia, Volume 2: Linking Text and Experience, Review of Biblical Literature [http://www.bookreviews.org] (2014).